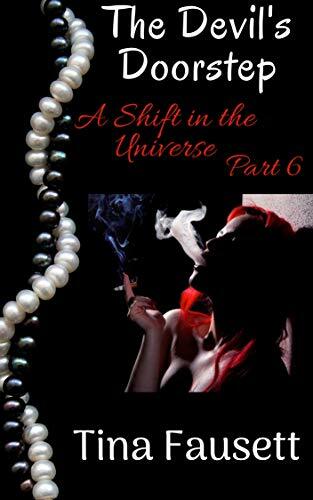 Part 6 in the “A Shift in the Universe” Series, “The Devil’s Doorstep” is now ready for pre-order. This is the final part in the first book of the series and promises to leave you on that proverbial cliff, hanging on for the second book…enjoy! He didn’t hear what she was going to say, his disappointment and own fear of the unknown, gripping him so fiercely his hand was vibrating as he hit End and walked into the restroom. It was empty, except for an elderly man washing his hands. He smiled at him, said hello then went into a stall. When he heard him walk out, Bane opened the door and looked around to make sure someone else hadn’t walked in, set the cell on the floor and stomped on it several times, shattering it. Picking it up, he pulled the chip out and stuck it in a book in his briefcase, then tossed the cell in the nearest trash receptacle, pushing it to the bottom and covering it with paper towels. He felt like he was going to be sick. Damn you, Gina, he said to himself, slowly boarding the plane that was surely going to take him to hell, one way or another. He’d had Brad go to Houston and follow Bane in the airport, making sure he got on the plane going to Peru. He’d been worried the man might have had a change of heart. It wouldn’t be the first time. In the past, Bane had always been good at rewriting the rules. But this was a different game, and Darsh was relieved to get the text that he’d boarded and was in the air. Stepping outside the warehouse, he noticed the inside of Gina’s house had darkened, the outside lit eerily by the moon, the white stucco almost shimmering, as breezes from the Mississippi behind him caused the leaves of live oaks to dance mystically and glow ghostlike. Instinctively, he knew Gina hadn’t gone to bed. She’d be drinking and smoking…trying to wrap her head around what was going on. She’d bemoan the loss of Bane, and try to convince herself that she’s in love with him. And eventually, she’d be sick and hurl…she always did. The spells would start, and she’d call for Tommy to save her…never knowing he was already here. In the morning, he would meet with her, but she wouldn’t know who he was. Darsh sighed with the anger and disgust he felt for her, but couldn’t stop the burning of unshed tears, as he thought of all that had happened between them.